N° Pezzi: 30 pz assortiti. I nostri corrieri Siamo venditori professionali e lavoriamo con impegno e passione. Entrambi ci penalizzano moltissimo e non risolvono il problema. SPECIFICHE PRODOTTO. Le spese di restituire il prodotto incarica all’aquirente. Qualsiasi prodotti difetti erano cambiati o compensati secondo alla nostra scorta di magazzini. Non si possono essere cambiati i prodotti senza infetti. ABBIAMO LA POSSIBILITA' DI FORNIRE ANCHE I PORTAFUSIBILI COMPRENSIVI DI CAVI ELETTRICI GIA SALDATI ED ISOLATI SUL PORTAFUSIBILE. SONO DISPONIBILI ANCHE I FUSIBILI IN VETRO. DIFFIDATE DAI PRODOTTI CONCORRENTI "MADE IN CHINA". Fusibili micro bi-lama 10 Pezzi assortiti di ottima qualita'. Misure: 5ax1 - 7.5ax1 - 15ax2 - 20ax1 - 25ax2 - 30ax1. AUTORICAMBI & ACCESSORI AUTO. Conservare SEMPRE 1 bolla con questa dicitura e la firma del corriere. Il prezzo è stato il livello di un normale fusibile in vetro. CONDIZIONI DI VENDITA. Portafusibile per fusibile a lama 9x20 mm2. Sono escluse tutte le zone disagiate ( es VENEZIA LAGUNA, CAMPIONE D'ITALIA ) e tutte le isole minori sotto elencate nella mappa. Le vendite on line sono soggette al diritto di recesso ai sensi dell'art. 64 del D.Lgs. Description:Material:Copper,ABSWire length:8.7cm/3.4''Wire Diameter:0.3cm/0.1''Voltage(Fuse Holder):DC 32VCurrent(Blade Fuse):25ATotal Size(Blade Holder):12.3x3x2cm / 4.84"x1.18"x0.79"(L*W*H)Total Size(Blade Fuse):1.9x1.9x0.5cm/0.7''x0.7''x0.2''(L*W*H)Feature:Removable Cap to Protect FuseAssortment:Universal Fuse Holder and Blade Fuse for Car Waterproof performance gives you safety protection.High fatigue resistance, melting resistance and excellent electrical conductivity. Package Content :4 x Fuse Holder4 x Blade Style Fuse . Description: Ideal for type fuses, fuses are included here. A great replacement fuse holder for auto, car, truck, boat, etc. Specifications: Description: They are fast-acting, blade-mounting 40A Car Fuses. Featuring plastic housing with push-on spade terminals. Designed for auto, battery and general DC applications. These Automobile Blade Fuses are perfect for professionals, DIYers, and more. 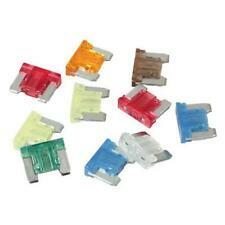 They are fit most type of fuse holders or blocks. Description: The fuses are fast-acting, blade-mounting 5A car fuses, features plastic housing with push-on spade terminals. Designed for auto, battery and general DC applications, fit most type of fuse holders or blocks. These automobile fuses are perfect for professionals, DIYers, and more. Description: Two straight female terminals, plastic exterior construction, 40A fuse, easy and convenient to use. An ideal replacement part for auto, car, vehicle, etc. 10 pcs 0287040. Tensione nominale 32V. Corrente nominale 40A. Serie del produttore ATO. Misura del fusibile 19mm. Tipo di fusibile fusibile. Besfestigungsschraube e di riduzione, in modo che anche le piccole sezioni senza muoversi. CONDIZIONI DI VENDITA. Specification: Type: Inline Fuse Holder Fuse Type:AGC Fitting:In-line Sercw Type Fits for:20 x 5mm/0.79 x 0.2 inch fuse Description: Inline fuse holder suitable for 5x20mm fuses. The holder separates by unscrewing and has an internal spring. Main use is in Cars, Trucks, Classic Cars, Caravans, Marine etc. Note:Fuse are not included. 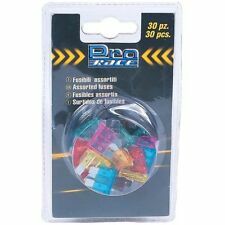 Package Included: 50( /-2%) x Wired Inline Fuse Holder. 30Un filo porta fusibile in linea il blocco auto Carrello barca 20pz. Specification: Description: Plastic inline fuse holder with 30A fuse. Red cable, plastic exterior construction, 30A fuse, easy and convenient to use. An ideal replacement part for auto, car, truck, vehicle, etc. . Description:Material:Copper,ABSWire length:8.7cm/3.4''Wire Diameter:0.3cm/0.1''Voltage(Fuse Holder):DC 32VCurrent(Blade Fuse):30ATotal Size(Blade Holder):12.3x3x2cm / 4.84"x1.18"x0.79"(L*W*H)Total Size(Blade Fuse):1.9x1.9x0.5cm/0.7''x0.7''x0.2''(L*W*H)Feature:Removable Cap to Protect FuseAssortment:Universal Fuse Holder and Blade Fuse for CarWaterproof performance gives you safety protection.High fatigue resistance, melting resistance and excellent electrical conductivity. Package Content :1 x Fuse Holder1 x Blade Style Fuse . Description:Material:PVC,MetalWire Gauge:10 AWGHolder Voltage:DC 32VBlade Fuse Current:15AWire Length:30cm/11.8''Wire Diameter:0.5cm/0.2''Dimension(Blade Fuse):1.9x1.9x0.5cm/0.7''x0.7''x0.2''(L*W*H)Dimension(Fuse Holder):42.5x36.5x9.5mm / 1.67"x1.44"x0.37"(L*W*H)Feature:Removable Cap to Protect FuseWaterproof performance gives you safety protection.High fatigue resistance, melting resistance and excellent electrical conductivity. Package Content :2 x Fuse Holder2 x Blade Style Fuse. Specifications: Description: The fuses are fast-acting, blade-mounting 35A car fuses, features plastic housing with push-on spade terminals. Designed for auto, battery and general DC applications, fit most type of fuse holders or blocks. These Automobile Blade Fuses are perfect for professionals, DIYers, and more. Produttore: Carpoint. DIRITTO DI RECESSO. MPN: CPT0810018. Fusibili universali il loro valore di Amper va dai 5 ai 30 A. Con giudizio corretto ci aiuterete ad avere successo e ad offrirvi prodotti a condizioni sempre migliori. PER QUALSIASI PROBLEMA O INFORMAZIONE. Specification: Description: Bolt-on fuse, easy to install on the fuse holder. Gold tone plated metal sheet construction with inspection window design. Ideal for high current applications such as inverters and car audio. . Description:Material:ABS,CopperWire length:8.7cm/3.4''Wire Diameter:0.3cm/0.1''Voltage(Fuse Holder):DC 32VCurrent(Blade Fuse):10ATotal Size(Blade Holder):12.3x3x2cm / 4.84"x1.18"x0.79"(L*W*H)Total Size(Blade Fuse):1.9x1.9x0.5cm/0.7''x0.7''x0.2''(L*W*H)Feature:Removable Cap to Protect FuseAssortment:Universal Fuse Holder and Blade Fuse for Car Waterproof performance gives you safety protection.High fatigue resistance, melting resistance and excellent electrical conductivity. Package Content :2 x Fuse Holder2 x Blade Style Fuse . Description:Material:Copper,ABSWire length:8.7cm/3.4''Wire Diameter:0.3cm/0.1''Voltage(Fuse Holder):DC 32VCurrent(Blade Fuse):20ATotal Size(Blade Holder):12.3x3x2cm / 4.84"x1.18"x0.79"(L*W*H)Total Size(Blade Fuse):1.9x1.9x0.5cm/0.7''x0.7''x0.2''(L*W*H)Feature:Removable Cap to Protect FuseAssortment:Universal Fuse Holder and Blade Fuse for Car Waterproof performance gives you safety protection.High fatigue resistance, melting resistance and excellent electrical conductivity. Package Content :1 x Fuse Holder1 x Blade Style Fuse . Description:Material:Bakelite,CopperWire length:8.7cm/3.4''Wire Diameter:0.3cm/0.1''Voltage(Fuse Holder):DC 32VCurrent(Blade Fuse):10ATotal Size(Blade Holder):12.3x3x2cm / 4.84"x1.18"x0.79"(L*W*H)Total Size(Blade Fuse):1.9x1.9x0.5cm/0.7''x0.7''x0.2''(L*W*H)Feature:Removable Cap to Protect FuseAssortment:Universal Fuse Holder and Blade Fuse for Car Waterproof performance gives you safety protection.High fatigue resistance, melting resistance and excellent electrical conductivity. Package Content :4 x Fuse Holder4 x Blade Style Fuse . Description: Suitable for auto car, boat or other vehicles use. Offers complete protection for your car’s audio system. Cuts off the power automatically when the electricity is strong. 5 way design power distributor. MORSETTI PER BATTERIA AUTO NEGATIVO E POSITIVO. IL PREZZO E' RIFERITO A 2 MORSETTI. Per esercitare il diritto di recesso, il consumatore è tenuto a informarci della. Ricordiamo che siete sempre i benvenuti. Description Great look and added protection to any system Special car fuse such as light indicator for fuse is burnt out and extra thermal protective case are available upon requests Fuse is not included here. Descriptions: The fuses are fast-acting, blade-mounting 15A car fuses, features plastic housing with push-on spade terminals. Designed for auto, battery and general DC applications, fit most type of fuse holders or blocks. These automobile fuses are perfect for professionals, DIYers, and more. Specifications: Description: They are fast-acting, blade-mounting 15A Car Fuses. Featuring plastic housing with push-on spade terminals. Designed for auto, battery and general DC applications. These Automobile Blade Fuses are perfect for professionals, DIYers, and more. They are fit most type of fuse holders or blocks. Descriptions: The fuses are fast-acting, blade-mounting 3 car fuses, features plastic housing with push-on spade terminals. Designed for auto, battery and general DC applications, fit most type of fuse holders or blocks. These automobile fuses are perfect for professionals, DIYers, and more. IN VENDITA QUESTA SCATOLA PORTA FUSIBILI CODICE 46760255 PER FIAT PUNTO 2° 188 1.2 16 VALVOLE. Specification: With this fuse adapter tap kit, you can easy to add a extra power or connection to the fuse box without cutting the wire. With this amazing fuse adapter, you can easy and safer to add an extra circuit to the external power device. Only fit Mini(ATM, APM) Blade Fuse Max. voltage: 32V Max. current: 40A Holding current: 5A Total Length: Approx. 16cm / 6.3 inch Package Includes: 1x Fuse Tap for Mini Blade Fuse . Description:Material:Copper,ABSWire length:8.7cm/3.4''Wire Diameter:0.3cm/0.1''Voltage(Fuse Holder):DC 32VCurrent(Blade Fuse):30ATotal Size(Blade Holder):12.3x3x2cm / 4.84"x1.18"x0.79"(L*W*H)Total Size(Blade Fuse):1.9x1.9x0.5cm/0.7''x0.7''x0.2''(L*W*H)Feature:Removable Cap to Protect FuseAssortment:Universal Fuse Holder and Blade Fuse for CarWaterproof performance gives you safety protection.High fatigue resistance, melting resistance and excellent electrical conductivity. Package Content :4 x Fuse Holder4 x Blade Style Fuse .